“Breakfast in Amritsar, lunch in Lahore, dinner in Kabul and then breakfast in Teheran,” -Afghanistan’s President Hamid Karzai unveiled, with these words, his vision for the region as an area of seamless travel. The Afghan leader was tweaking Indian Prime Minister Manmohan Singh’s dream of breakfasting in Amritsar (India), lunch in Lahore (Pakistan) and dinner in Kabul to include Teheran. It is good to have a vision for peace even if the reality on the ground makes it look like wishful thinking at present. But the Afghan leader was also making a subtle point that Afghanistan was not tied only to Pakistan but it existed in a wider region that included India and Iran. President Karzai referred to his country’s location as “Central South Asia” and emphasized the old linkages of trade and culture that existed within this region. President Karzai was addressing a gathering of the capital’s elite while on a two-day visit to India, when he spoke of the ‘Europe model’ where they had much deeper conflicts and had fought wars but had gone on to build a region of peace and prosperity. 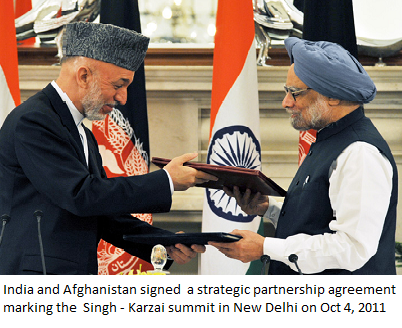 A day earlier, the Afghan leader had signed a Strategic Partnership Agreement with Indian Prime Minister Manmohan Singh, which would broaden and intensify the cooperation between the two countries as well as grow into new areas. It is a turbulent time for Afghanistan and President Karzai has had to make changes in his government’s policies after the assassination of former President Burhannudin Rabbani by a suicide bomber, who came in the guise of a messenger from the Taliban. The former president had headed the High Peace Council that was to conduct negotiations with the Taliban. President Karzai indicated a turning point in the peace process when he said in Kabul a day before his departure for Delhi, that his government would not talk to the Taliban either directly or indirectly. Mr Karzai elaborated on the subject while giving a memorial lecture in Delhi. “We do not have their address, we don’t know where they are,” he said about the Taliban, adding that “the peace process would focus on countries and not on organisations.” The Afghanistan government would intensify its dialogue with Pakistan, a country that was also facing the menace of terrorism, he said. Mr Karzai also sought to dispel any misgivings about the Strategic Partnership Afghanistan has signed with India, asserting that it was not against any country or entity. He said the partnership was to benefit Afghanistan from the strengths of India and help its people for a better way of life by improving skills and to train police, army, doctors and professionals. President Karzai described Pakistan and Afghanistan as twin brothers while India was a great friend. “The agreement with our friend is not against our brother,” he said. The Strategic Partnership Agreement with India is the first one to be signed; similar agreements with the US and the EU are under negotiation. The agreement aims to boost trade, security and cultural links between the two countries. It is a reaffirmation of India’s commitment to the reconstruction and development of Afghanistan according to the wishes of the Afghan people; it was a commitment that Prime Minister Manmohan Singh had reiterated in his address to the Afghan Parliament in May this year. India is among the major aid donors for Afghanistan, taking up projects from supplying fortified biscuits for mid-day meals for school children, to constructing the Delaram-Zaranj road, to providing medical assistance, telecom services, building the Parliament building and the electric transmission lines for Kabul. The main focus of India’s developmental assistance in Afghanistan is people-oriented. Its emphasis on health and education in its developmental projects together with capacity building in agriculture has built up much public goodwill among the Afghans. During Prime Minister Manmohan Singh’s visit to Kabul in summer, India increased its developmental assistance to US $ 2 billion. Significantly, India has, for the first time, agreed to assist in the training, equipping and capacity building for Afghan national security forces. While India has carried out training programmes for the police, and a few officers of the Afghan armed forces have attended courses in Indian defence institutes, but neither India nor Afghanistan were ready to undertake regular training of Afghan forces by India. India had made a conscious effort not to take a high profile role in its engagement with Afghanistan, mainly because of Pakistan’s discomfort with India’s growing involvement in Afghanistan and the American dependence on Pakistan as an ally in the war against the radical forces in Afghanistan. India’s reluctance to get involved in regular training of Afghan security forces also stemmed from Pakistan’s hyper-sensitivity to India’s influence in Afghanistan. The Indian government’s policy for Afghanistan has focused on developmental projects and capacity building, but in the changing circumstances in Afghanistan, it is ready to step up its engagement with Afghanistan. Afghanistan is also looking for investment from India and the two countries signed two preliminary agreements for development of mineral resources and exploration of natural gas. Indian companies are seeking to bid for the mining contract for the Hajigak mines, reported to be one of the largest unexplored iron ore reserves. Indian oil companies have also shown interest in exploring for natural gas in the northern Afghanistan. President Karzai’s vision was echoed in a new initiative led by the US and Germany known as the New Silk Route, which was discussed at a meeting in New York last month. The meeting was attended by representatives of the Central Asian republics, as well as ministers from China, Iran, Pakistan, India, Canada, Norway and other countries. US Secretary of State Hillary Clinton had stressed at the meeting that the stabilisation of Afghanistan was linked to prosperity in the wider region. The New Silk Route plan envisages Afghanistan as the centre of a network of trade corridors with railways, roads and trading facilities, with economic linkages connecting Central and South Asia. Such a network could restore Afghanistan to its age-old role as the bridge between Central and South Asia to the Middle East. And it can make possible travel in a day from Amritsar in India through Lahore in Pakistan, and Kabul to Teheran. This entry was posted in AfPak region, ISI, News and tagged Af-pak policy, Strategic Partnership, terrorism, US plans for troop pull out. Bookmark the permalink.